MARLOO, THE WORLD'S FIRST H28, WAS BUILT HERE IN AUSTRALIA. AS PART OF OUR TRIBUTE TO THIS CLASSIC DESIGN WE ASKED CURRENT OWNER GRAHAM YOUNG TO TELL OF HER RECENT REFURBISHMENT. Holidaying down in Metung on the Gippsland Lakes in Victoria an advertisement outside the boat shop caught my eye. The first H28 built, Marloo, was for sale here. I immediately fell in love, attracted to the beautiful lines drawn by L. Francis Herreshoff almost 60 years ago. Here was a yacht worth looking at. Twenty minutes later I was sitting in Marloo's cockpit with her owner in her nearby berth in beautiful Chinaman's Creek. To the sounds of bellbirds he told me of her history as he showed me over her. It was a coincidence that Marloo was the same age as myself and had been built close to my home in Brighton. After looking her over I had her surveyed to assess her condition. The inspection revealed some rot in a rudder cheek, but otherwise she appeared sound. We agreed terms and soon after I became the proud owner of Marloo. I expected some work because of her age, but had little inkling of what lay ahead. Marloo's creation John Dingle of Brighton, Victoria, a marine engineer, decided to build Marloo as soon as the plans came out in Rudder magazine in 1942. 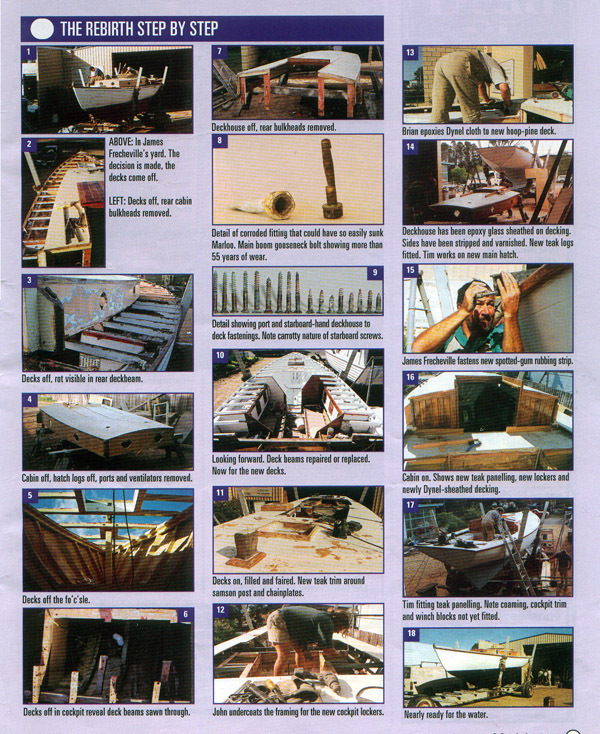 John was ahead of other H28 builders thanks to his previous experience of building a Herreshoff seven-meter, Prudence. Marloo was built to plan, with a few notable alterations. The cockpit was moved aft to fit a self- draining cockpit and bridge deck to provide better visibility and keep rainwater from her bilge. Many of the fittings John made -such as the bronze goosenecks, gudgeons and pintles - are still in use today. Also, John added twin masthead backstays and an extra shroud to support a masthead genoa. 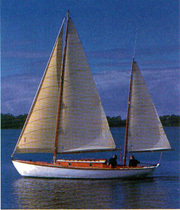 The 8.54m Marloo was launched in 1944 and sailed by John Dingle, Jock Sturrock and others from the Royal Brighton Yacht Club, where she raced very successfully. Jock, who also sailed in the America's Cup contender Gretel, was so impressed with her performance that he had his own H28, Safari, built by Savage of Williamstown. oving the decking in the cockpit area revealed that some of the beams and the decking had been cut through -probably to improve access to her bilges aft. 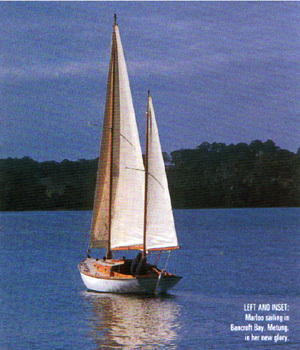 With her decks and deckhouse gone, Marloo resembled a large open dinghy. The Yanmar YSE 8hp was hoisted out and sent away for service. The prop shaft was found to be bent as a result of poor engine alignment. A new shaft was ordered. Each propeller blade had a different pitch, so it was sent away for balancing and adjustment. Three of the four engine mounts had failed. The motor had been held in place by the bent prop shaft and one engine mount. The old steel engine mounting and wooden bearers were removed. Some rot was found in the underside of the rudder blade and there was excessive play between gudgeons and pintles. The mainmast appeared original, and previous repairs, with some exception, looked sound. Her mizzenmast was a fine replacement, made by Peter Bull of Metung, and appeared in very good condition. Her chainplates were sound, but her mainmast rigging needed replacement. The main hatch logs were worn and rotten in places. Both hatches had been covered with an additional layer of planking, and were very heavy to use. The main hatch was insecure because its runners too were very worn. Close examination of her hull confirmed that her kauri planks were in fine condition, apart from a damaged plank high on her starboard bow. fore it was refastened. To completely seal her decks, new teak trims were fitted around her deckhouse, samson post and chainplates. The cockpit Then our attention turned to the cockpit. To improve strength in her quarters, we replaced beams under the cockpit decking that were previously cut through. The cockpit floor was epoxy biaxial glass sheathed for increased strength. Two new waterproof hatches were fitted in the floor for ready access to the rear of the engine, gearbox and shaft. Decking identical to the main decks was fitted around the cockpit and bridgedeck. New large useful lidded lockers were constructed each side of the cockpit. Their framing formed to provide good drainage to keep them dry. Removable locker floors were installed to allow ample storage while allowing ready access to the bilges. A new teak frame was fitted around her teak trivet at floor level and new sub-coamings were fitted to support the original refinished kauri coamings. Her masts were completely stripped, and some repair and reglueing was required on the mainmast. Both bronze gooseneck boom fittings were very badly worn and were rebuilt by Briggs of Melbourne. All mast fittings were refastened and the mast refinished with eight coats of varnish. A new teak mast partner formed a seal at deck level. Her solid timber winch supports had weathered badly at the end grains. These were epoxy filled, refinished and refitted with her other deck fittings. The mainmast rigging was replaced by Webster Marine of Paynesville and a Pro Furl B29 furler was fitted by James Frecheville. John Hooper of South Melbourne made a new set of sails that closely resembled the color of the original Egyptian cotton sails. T o follow the older style of sail manufacture the width of cloth was halved, doubling the number of seams to give a more traditional look. We are delighted with the new sails and the smart new navy sail covers. Cabin In the cabin, new tailored bunk cushions with a removable center-bunk section were made and fitted by Top Trim of Bairnsdale. This has greatly enhanced comfort and amenity below. A new radio cabinet and porta-potti pedestal were installed, the former providing welcome additional storage, the latter a safe and well-positioned perch providing a good view through her forward and starboard ports. Otherwise her focsle has been left clear except for rows of large brass hooks along her carlines. All our gear can be stowed in the lockers or in bags on these hooks. This works well and keeps her focsle and saloon floors free of clutter. Freshly painted and varnished, Marloo re-entered the water, had her masts stepped, and was ready for the trip home. However, shortly after leaving disaster struck. Alarming sounds came from the engine. Smoke billowed from her exhaust. A broken piston ring, or worse. A sad trip back to the slipway to have the engine hoisted out again. A new engine was considered, but with budget constraints, it was decided to fully rebuild the existing Yanmar YSE 8hp. Thanks to very careful handling the engine was removed and re-installed without a scratch on her varnish. After an initial running in period, it now runs very well. The renovation a fine job by Bairnsdale Marine. A year or so on, we are delighted with Marloo and the work done by James Frecheville & Co and others. There are still a few odd things to do. But isn't that always the case? With her shallow draft of one meter and spacious flat decks we find her ideally suited to the Gippsland Lakes. Was it worth it? All the time and expense? Yes, definitely! We are delighted to put Marloo back into fine condition. When the time comes to pass her on, we are confident this historic yacht will give joy to many more owners and others in the years to come.